Wide upper engine doors on each side of the cowl provide easy access to the engine compartment for maintenance and service. The cowl separates into three pieces for easy removal and installation. 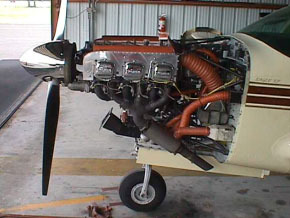 The full-length nose gear doors completely close the lower cowl to greatly reduce drag, The augmentors ramped on the lower cowl improve the engine exit air flow, reduce engine cooling drag, improve engine cooling in all angles of attack, eliminates shock cooling and requires no additional cowl flaps or gear door motor. All new Stainless Steel Dual Exhaust System (PA24-180/250), made of 331 Stainless improves engine performance reduces firewall cabin heat and cabin noise. Less maintenance, lighter weight and no AD's. Naca scoops on either side of the lower cowl (PA24-180/250) improve cabin-cooling air and reduces cabin noise. Made of Flame Retardant Resins and Fiberglass Cloth, the cowl is easily repairable if damaged, thus reducing the future maintenance costs of your Comanche. Experience an average 5-15% increase in the overall performance, more uniformed cooling and improved cylinder head temperatures. Fred Lasby's 260B Comanche with our cowling installed completed an around the world trip in 168 hours with an average True Airspeed of 175 Knots. 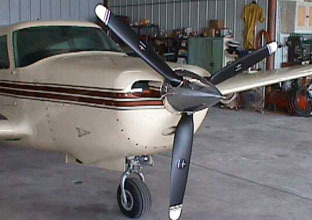 CLICK HERE for more information on Comanche Eagle XP Cowling.